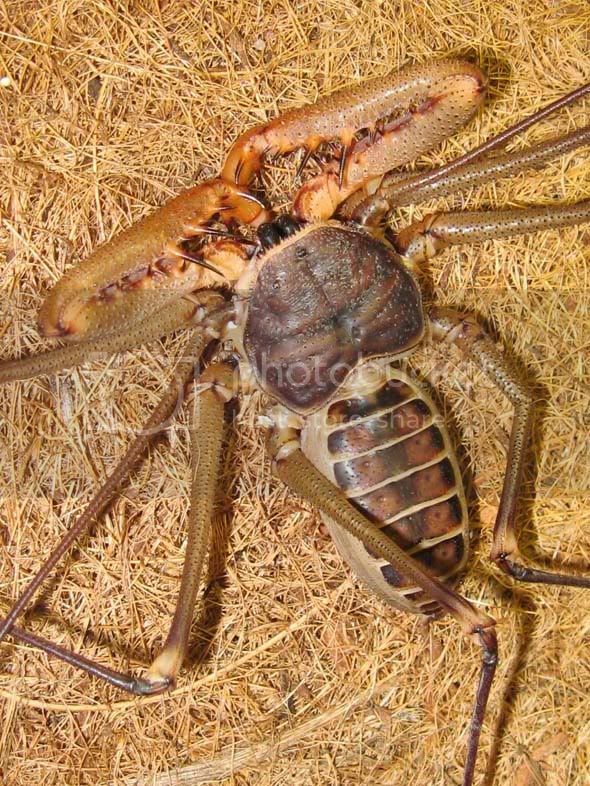 Known as "tailless whipscorpions" and "whip spiders" these animals are found in tropical and sub-tropical regions in humid environments. They lack a telson to sting and venomous fangs, so they are totally harmless. They can give a mild pinch with their pedi palps. They are very delicate creatures as their legs and antenna are easily broken if mishandled. They make very interested display animals and are an excellent animal to introduce children to the world of arachnids. 2) Fill out the necessary order form by clicking here. • Acanthophrynus coronatus "Giant Cave Whip", RARE! We hope to make this giant (grows to 16" leg spans counting the antineforms) available in 2012! • Damon diadema "Tanzanian Giant Banded Tailless Whip Scorpion", Not common anymore, rarely been offered since 2012. WC unsexed juveniles to /adults, $45, 6+@$43 ea. • Phrynus marginemaculatus "Florida Tailless Whipscorpion", WC unsexed sub-adults/adults, rarely made available as South Florida becomes more developed, When in-stock, $22 ea. OR field-collected for your order: 6@$20 ea.,12+@$18 ea.